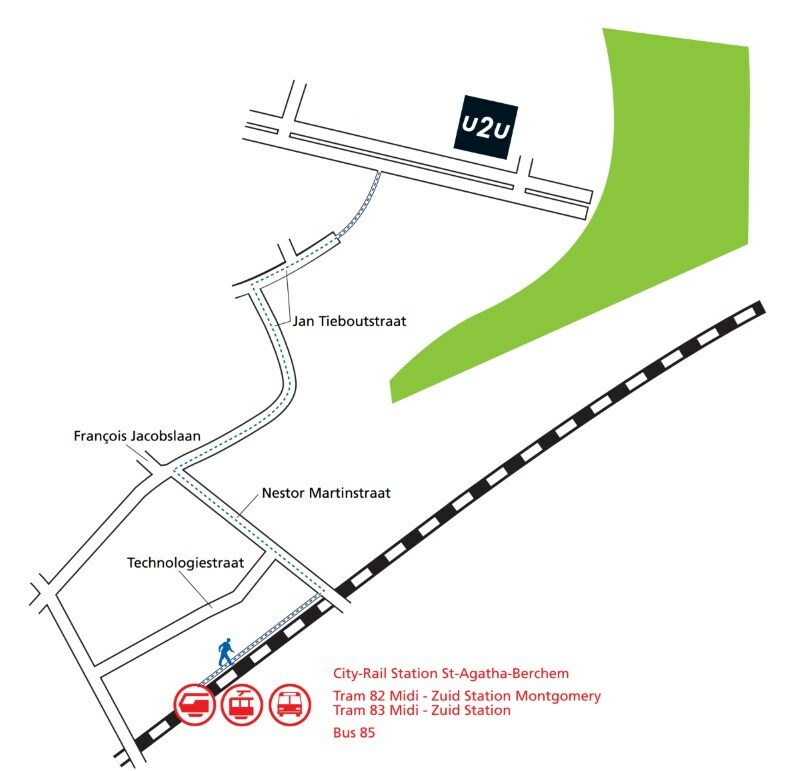 The U2U offices are located in Brussels, about 500m from the Highway R0 (Brussels Ring) Exit 10. Sufficient free parking space is available on the Research Park avenue immediately in front of the U2U building. Please do not park on reserved or visitor parking slots. U2U is located within 5 minutes walking distance of bus stop "Ganshoren Sport" of line 84 & 87. The walking path below will take you in 15 minutes from the city railway station "Sint-Agatha-Berchem" to the U2U offices. From the Brussels International Airport, it takes you 15 minutes by taxi to come to U2U, or 35 minutes by train. From Brussels South Airport (Charleroi) it takes you about 30 minutes by taxi or 1 hour by shuttle bus and train. The high speed trains TGV, Eurostar, Thalys, ICE stop in the railway station "Bruxelles Midi"; The ICE also stops in Brussels Central and North Station. There you can take a local train that brings you in about 20 minutes to U2U.